As with other pathogens, the genome of Staphylococcus aureus can be subdivided into core and accessory segments, comprising roughly 75 and 25% of the genome. Particular attention is given to the MRSA252 strain, which is phylogenetically distinct from other S. aureus genomes, is epidemic in the United Kingdom and North America, and is closely related to methicillin-susceptible clinical isolates that are hypervirulent in musculoskeletal infection models. This strain contains a number of unique or unusual small-scale variations compared with other genomes, and their potential significance as mediators of virulence is discussed. With respect to horizontally transferred virulence determinants of the core genome, another focus is to assess the integration sites of toxincarrying prophage, in terms of a potential cost-benefit relationship. The Staphylococcal Cassette Chromosome is discussed in terms of its role in promoting the evolution of antibiotic resistance, and as a potential mediator of genetic diversity and gene shuffling between species. The association of pathogenicity islands (SaPI) with temperate prophage is considered, with emphasis on a segment of the genome flanking the coa (coagulase) allele, and the diversity of SaPI content, such that there does not appear to be a single SaPI that is associated with the majority of virulent strains. 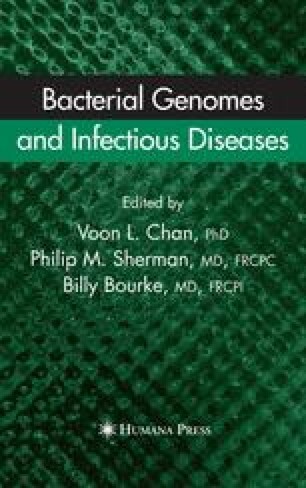 The vSaoα and vSaβ genomic islands, which can be variable in composition, but common to all strains, are discussed in terms of how they may provide insight into the infection strategy of S. aureus, and how vSaβ may be coevolving in association with antibiotic-resistant hospital-adapted strains.